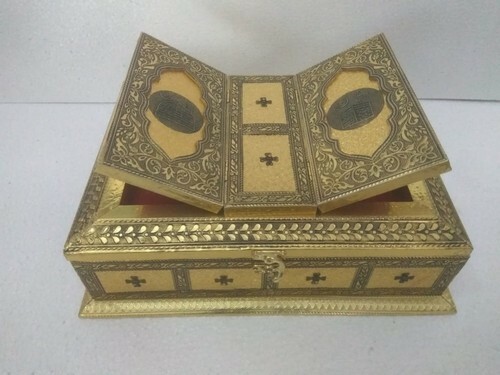 Our entity is instrumental in offering an all-embracing array of Quran Box. Our range of these boxes are designed and developed using optimum quality solid wood and with the help of latest methodology in order to harmonize with the worldwide standards. These are acknowledged for its durable finish standards and designs. Established in the year 2014, we “GSM Global Impex” are a distinguished and prominent organization which is betrothed in manufacturing an exclusive and wide collection of Bangle Box, Dry Fruit Box, Chocolate Box, Jewellery Box, Flower Pot, etc. Situated at Rajkot (Gujarat, India), we are supported by a well structural and wide infrastructural unit that assists us in the designing of an attractive range of products as per the industry set norms. We are a Sole Proprietorship Company that is managed under the headship of our mentor “Mr. Sagar Gadhiya”, and have gained a noteworthy and dynamic position in this field.